Airman who participated in the 2015 Load Crew of the Year competition pose for a photo March 10, Creech Air Force Base, Nev. The competition dates back to the Korean war and is an event used to raise morale within the unit, as well as to ensure that Airmen gain experience loading munitions in high-stress scenarios. CREECH AIR FORCE BASE, Nev. — Airmen assigned to the 432nd Wing/432nd Air Expeditionary at Creech Air Force Base, Nevada, work around the clock to bring support to the remotely piloted aircraft enterprise. Supplying the MQ-1 Predator and MQ-9 Reaper with munitions is just one way the 432nd Aircraft Maintenance Squadron weapons load crew Airmen aim for excellence and exemplify what it takes to accomplish just that. Airman 1st Class Quantavious and Airman 1st Class Ricardo, both AMXS weapons load crew members, and Staff Sgt. Charlie, AMXS weapons load crew chief, were selected to represent Reaper Aircraft Maintenance Unit at the 2015 Load Crew of the Year competition slated for March 9, 2016. Also competing for the title from Tiger AMU are Staff Sgt. Justin, AMXS weapons load crew chief, Senior Airman Christopher and Airman 1st Class Stuart, both 432nd AMXS weapons load crew members. Reaper Aircraft Maintenance Unit at the competition. This friendly competition challenges a three-person weapons loading team to see who can load munitions faster and more effectively, while keeping safety in mind. As an integral part of load crew tradition, it furthers skills and promotes camaraderie between the two RPA maintenance units. “These load competitions help our teams exercise their skills and abilities to execute the mission in a safe environment first, and prepare to execute missions for combat operations, all while improving morale within the units,” said Col. Matthew Finnegan, 432nd Maintenance Group commander. 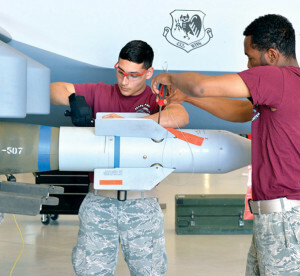 For each load crew competition, teams are graded on a number of factors such as the loading of AGM-114 Hellfire missiles and GBU-12 Paveway II laser-guided bombs in a set time, while committing as few discrepancies as possible. The teams are also graded on dress and appearance, a knowledge based test, and their composite tool kit. Airman 1st Class Stuart said the competition helps to emulate an emergency situation where the crews have to load munitions quickly and perfectly, while under stress. 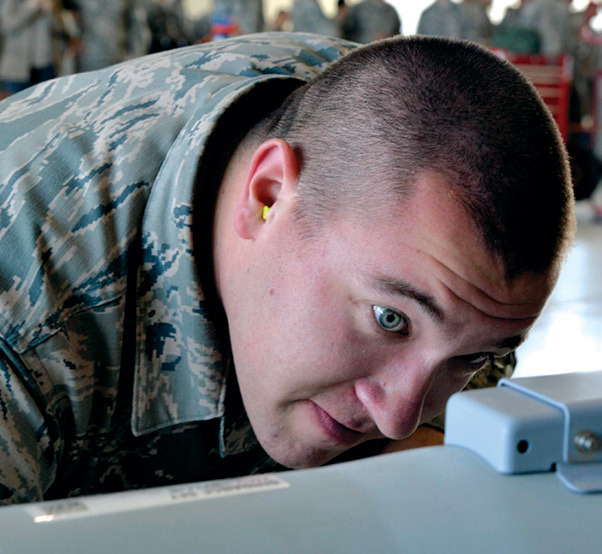 Going into the contest, Airmen know nothing about the tasks ahead of them. To prepare, they keep their skills sharpened by visiting the ‘load barn’, or weapons standardization section to train and increase knowledge. There are nine small teams in Reaper AMU, each with a unique name. Quantavious, Ricardo and Charlie make up Crew 25 in Reaper AMU. Load crew teams are responsible for loading both live and inert munitions to support the training schedule at home station, as well as the heavy operations tempo downrange. Frederick went on to say what makes the crew special is its Airmen and the leadership of a seasoned team chief. Staff Sgt. 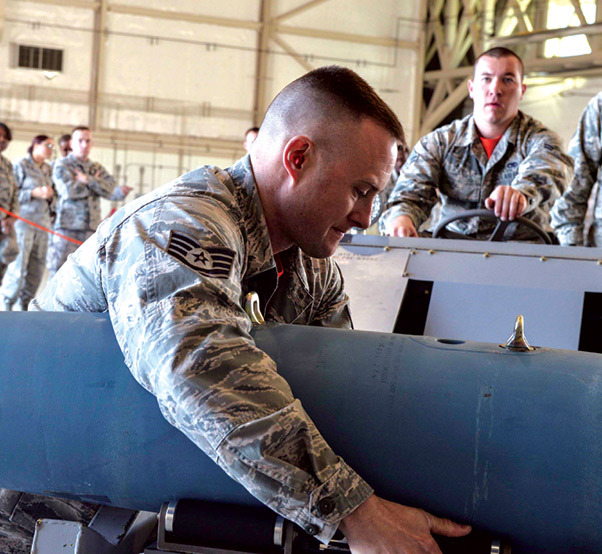 Justin, 432nd Aircraft Maintenance Squadron weapons load crew chief, loads a bomb onto the aircraft during the 2015 Load Crew of the Year competition March 10, at Creech Air Force Base, Nev. Justin is in charge of Airman 1st Class Stuart and Senior Airman Christopher, both 432nd AMXS weapons load crew members. 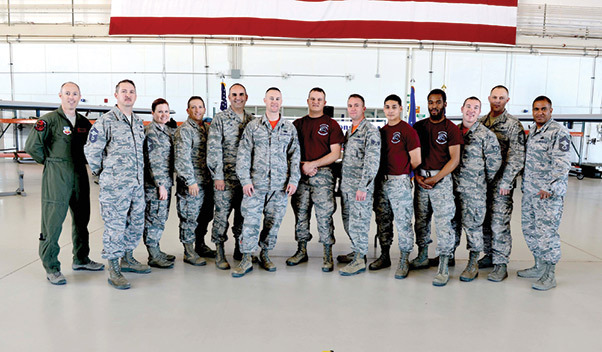 Charlie ‘s crew won both the second and fourth quarter Load Crew of the Quarters in 2015, which is rarely accomplished by Airmen of their rank. They were also selected to participate in exercise Combat Hammer, designed to assess and evaluate the reliability, maintainability, suitability and accuracy of RPA munitions. 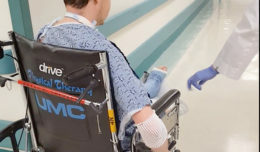 By comparison, Justin, Christopher and Stuart were selected individually from crews three, four and nine of Tiger AMU to compete based on their ability to perform above standard. The team participated in the Load Crew of the Quarter competition December of 2015, and proved they had what it takes to compete in the annual competition. Staff Sgt. Nelson, 432nd AMXS weapons load crew chief, said the Airmen from Tiger AMU were picked for their overall performance and fast load times. Individual merit and the ability to carry out their tasks above average are what makes them the load crew of choice from Tiger, said Nelson. Names of the winners will be released April 1, 2016 at the Maintenance Professional of the Year banquet. 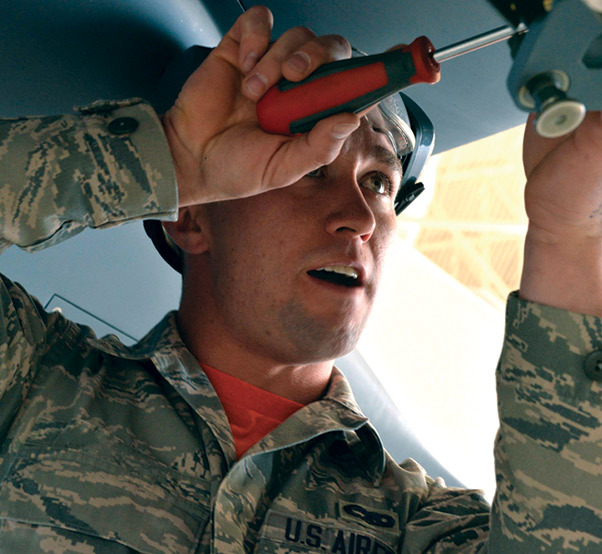 Senior Airman Christopher, 432nd Aircraft Maintenance Squadron weapons load crew member, performs maintenence on an MQ-9 Reaper weapons pylon during the 2015 Load Crew of the Year competition March 10, at Creech Air Force Base, Nev. Load crew members are responsible for servicing approximately 40 MQ-1 and MQ-9 aircraft operated at Creech. 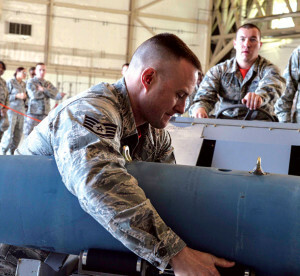 Airman 1st Class Stuart, 43nd Aircraft Maintenance Squadron weapons load crew member, inspects a munition at the 2015 Load Crew of the Year competition March 9, at Creech Air Force Base, Nev. During the competition, load crew members check munitions to ensure they are serviceable.